Teaching ESL pronunciation is one of the hardest things ESL teachers do because there are so many variables to consider; but, here are some tips and resources that will hopefully make teaching ESL pronunciation a little easier. When you understand how all these things work together to create a spoken language, you will be able to better teach English pronunciation. Phonemes are the individual sounds that, when glued together, make up words. They include both vowel and consonant sounds, and when one or more phonemes is changed in a word, the word is also changed. 1. Demonstrate - This may seem exceedingly obvious, but the first step in teaching pronunciation is to demonstrate sounds for your students so they can see what you're doing with your face and mouth. You can use your own face and mouth, or you can use models or diagrams to show the proper placement of the tongue, lips and teeth to produce a certain sound. 2. Exaggerate - Many times, the difficulty students have with English pronunciation stems from the fact that their language doesn't have the same sounds. The "th" sound (voiced or unvoiced), especially, can be quite difficult because it simply doesn't exist in most other languages. When you say, "thanks," your tongue barely touches your teeth for just a fraction of a second. If you watched someone say it in slow motion, you'd see their tongue peek out for just a moment. This is a very different sound from the "s" sound. Your tongue MUST touch your teeth to make it. You have to push a lot of air through when you say it. I will make you look like a complete idiot, and the students will always laugh at you and never want to make fools of themselves in the same way, but they learn how to say the "th" sound, by-golly. 3. Differentiate - When a sound doesn't exist in a student's native language, they always find a substitute sound that they are familiar with. The "th" sound can turn into an "f," "s" or "t" sound depending on the student's native tongue. When Spanish speakers say they live on the "turd" (third) floor, I only have to explain what a turd is, and they don't make that mistake again. When Japanese speakers say that Tokyo is a very nice "sh**ty" (city), an explanation of what sh**ty means, makes that easy to correct too. Correcting most of these mistakes is not quite as urgent, but with a few examples, students will understand why each sound is important, and they will work hard to get each phoneme correct. They only need you to teach them the difference. One of the biggest reasons non-native English speakers sound non-native is that they try to speak English in the rhythm of their native language. Each language has its own "music," so to speak, with emphasis placed on different words. In some languages, equal stress is placed on each word. In English, each phrase has a "focus word" that receives the emphasis. Content words are the words you absolutely need to understand in order to receive the message of a sentence. Function words are the words that are necessary for grammatical purposes, but that can be removed without losing much (if anything) in the way of communication. We see these two types of words emerge as children learn to speak. Toddlers communicate only in content words: "Mama, juice." Given the context, anyone can understand that the child is asking his mother for juice, or perhaps commenting that the mother has a glass of juice. As language skills develop, children begin using function words as well (pronouns, prepositions, articles, auxiliary verbs, conjunctions, etc.). The "focus word," the word that is emphasized in an English phrase, is usually the last content word in that phrase. There are exceptions to this rule, of course, if you want to shift the emphasis for some reason (to contrast or correct, perhaps); but, in general, that's how it works. Consider this sentence: "All of the penguins are on him!" How would a native speaker of English say this sentence? Would each letter be pronounced? Would the words be neatly separated? Absolutely not! Some sounds would be cut off, and all the words would be linked together in one long sound. This is normal and natural, and it's necessary for students to learn if they want to speak English fluently. Connect consonants to the vowels that follow. Connect vowels to the consonants that follow. The last piece of the pronunciation puzzle is intonation - the rise and fall of the pitch of your voice. Many people think that questions have a rising intonation and statements don't. This is not entirely true. At the end of a sentence, intonation falls. After a clause that does not end a sentence, intonation "waves." At the end of a "wh-" question to which the speaker does not know the answer, intonation rises, then immediately falls. When a speaker has misunderstood or not completely heard the answer to his question and repeats it, asking for clarification, intonation rises. When a speaker puts words in statement order, but means the statement as a question, intonation rises. When a speaker responds in shock, surprise or confusion, intonation rises. If you are a native speaker of English, you already have a huge resource at your disposal - your own voice. Trust your own English pronunciation; it has served you well so far. Study it, and pay attention to how you say things naturally. This will carry you far. YourDictionary has prepared a series of tips, activities and handouts designed to help the ESL student with pronunciation. Each of these are presented in a printable format for use as a teaching aid. Remember, the key to teaching ESL pronunciation is knowing how speakers, languages and accents sound different from each other. You need to help your students listen, speak and differentiate what's different. "Tips & Resources for Teaching ESL Pronunciation." YourDictionary, n.d. Web. 22 April 2019. <https://esl.yourdictionary.com/esl/esl-lessons-and-materials/tips-resources-for-teaching-esl-pronunciation.html>. 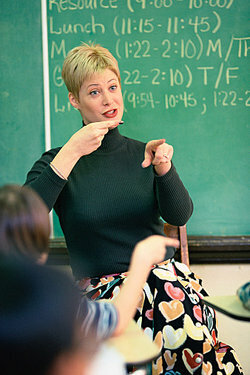 Teaching ESL pronunciation is one of the hardest things ESL teachers do because there are so many variables to consider; but, here are some tips and resources that will hopefully make teaching ESL pronunciation a little easier.Teaching ESL pronunciation requires a basic knowledge of what makes:One speaker sound different from anotherOne language different from anotherOne accent different from anotherWhen you understand how all these things work together to create a spoken language, you will be able to better teach English pronunciation.